P R O B L E M : You need to remove the wrinkles from your clothing, but waiting for a clunky iron to heat up and setting up a flimsy ironing board can be so time-consuming. Not only that, but some name-brand wrinkle release sprays contain chemicals that can be harmful to your health. 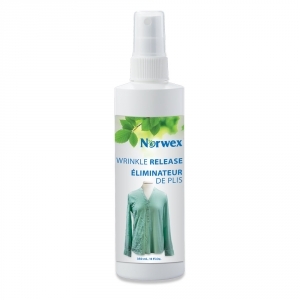 S O L U T I O N : Norwex Wrinkle Release Spray helps you easily, naturally and quickly remove unsightly creases and wrinkles from your clothing, without the harsh chemicals commonly found in similar products. Our Wrinkle Release Spray is specially formulated with unique ingredients to remove unsightly wrinkles in no time. Simply spray lightly, then gently tug and smooth the wrinkles away! It contains biodegradable ingredients found in natural hair conditioners that gently condition as they effectively remove wrinkles while preserving the shape of garments. It has a natural fragrance, it's phthalate free, and safe for bright colors and delicate fabrics. Keep one at home or take one with you to quickly get rid of creases and wrinkles wherever you go! 355 ml / 12 . oz. • Heat and water cause wrinkles. Heat breaks the bonds holding polymers in place within the fibers of a fabric. When the bonds are broken, the fibers are less rigid, and as the fabric cools, the fibers lock into a new (wrinkled) shape.